Tile inlets provide a direct conduit for surface water to leave the field. Surface waters tend to have higher nutrient and sediment loads. Private and public dollars to address erosion and nutrient-loss concerns from agricultural production fields are limited. A cost-effective way to reduce erosion and nutrient loss is to identify field situations that have higher risk critical resource concerns and then match Best Management Practices (BMP’s) for implementation to address the field situations.Private and public dollars available to address erosion and nutrient loss concerns from agricultural production fields are limited. Professionals from soil and water conservation districts (SWCDs), state agencies, and the Natural Resources Conservation Service (NRCS) have limited resources to cover the watershed to identify critical concerns for farmers and landowners. Fortunately, many critical concerns have obvious visual keys that farmers and landowners can use to identify the critical concerns so that they can then seek assistance to address the concerns with BMPs. 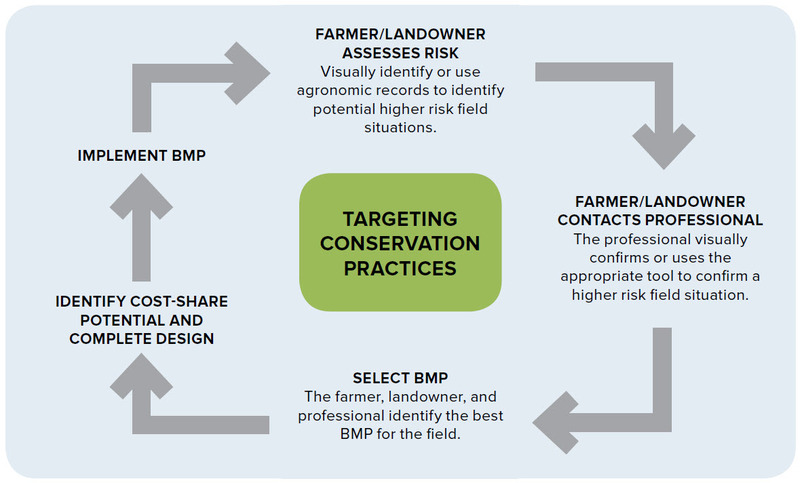 These visual keys can be observed in the landscape and as agronomic plans are reviewed and then brought to professionals in conservation to develop plans to address. Critical Concerns- Pictures and descriptions of critical resource concerns to use in identification plus links to potential BMP's that address those concerns. BMP Practices- A listing of all BMP practices with descriptions, effectiveness, pros and cons of the practice, things to consider and contacts for further inquiry. Frequently Asked Questions (FAQ)- Answers to common questions and helpful background information. Submit- A place to submit pictures of critical concerns or BMP's in action to add to the website or questions for FAQ. People- Contacts for people available to assist in answering questions.